In 2010, Guinea entered a new phase of structural reforms as part of a far-reaching plan to remove constraints on the realisation of the country’s significant potential for growth. The strengthening of democracy and economic liberalisation have created a stable and positive environment for foreign investment. Guinea opted for a transparent and fair pro-business approach in order to create a stable environment and attract capital that will energize all of Guinea’s economy, develop infrastructure and other sectors (including agriculture and energy), while at the same fostering education and employment in a win-win strategy for companies and the country. 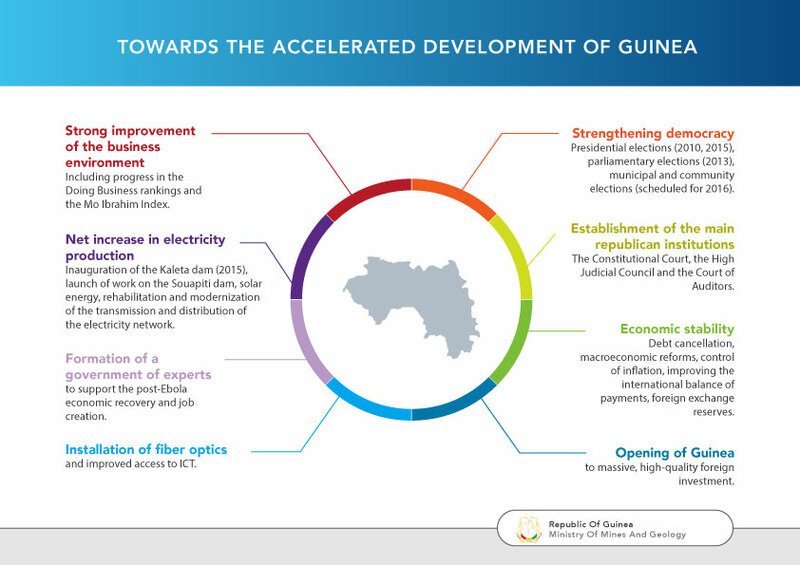 Guinea has since 2010 undertaken in-depth reforms of its legislative and institutional framework to accelerate the country’s development by promoting investment, instilling better financial governance and enabling the more effective management of its natural resources. Continuing a far-reaching programme of democratic transition, Guinea launched a major reform of its justice and security sectors, with the aim of training and professionalising its armed forces, police, civil protection, justice and customs officials by 2017. The reform included a biometric census of civil servants and the retirement of over 4,000 officials. In 2011, the government began a major restructuring of the energy sector to upgrade and develop its electricity production and distribution infrastructure, which included the establishment of a legal framework to facilitate investment. These efforts are of significant strategic importance, as the sector is one of the keys to the rapid and equitable development of the country. Economically, the government has implemented a series of reforms that led to the cancellation of foreign debt, control of public spending and inflation, and the creation of favourable conditions for development. An important step in modernising Guinea’s mining sector was the reform of the Mining Code, designed to encourage investment and ensure transparency and equity in the exploitation of resources. The new Mining Code was adopted in 2011 and amended in 2013 after extensive consultation with relevant actors. A new Petroleum Code was adopted shortly after, in 2014. The Mining Code provides for the full publication of mining contracts and strengthens transparency. Among its important advances are tax reform to attract investors while guaranteeing state revenues and policies beneficial to local communities, particularly by encouraging the creation of jobs and training Guinean workers. The revision of the mining cadastre allowed the cancellation of more than 800 inactive licences, while 98 licences were renewed and 222 new licences were granted. Guinea published all of its mining contracts online in 2013 (www.contratsminiersguinee.org), in a move welcomed by the international community and the country’s economic partners. Guinea has also joined the Extractive Industries Transparency Initiative (EITI), an international standard that aims to promote the transparent and accountable management of natural resources through the involvement of relevant stakeholders (encompassing the government, the private sector and civil society). Guinea is certified to the EITI standard since 2014, and as such is subject to regular review by an independent commission.